Plan for the addition of the nodes well in advance before the promotion, so that enough time is given for warming the cache nodes adequately. Now let us explore what is Consistent hashing? How it helps and so on. The idea behind the consistent hashing algorithm is to hash both objects and cache nodes using the same hash function and consistently maps objects to the same cache node, as much as possible. Consistent hashing uses a mechanism that acts like a clock. The hash function actually maps objects and cache nodes to a number range. The number range values wrap around like a circle, that's why we call this circle a continuum. 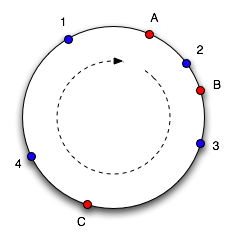 Imagine in the below picture a circle with number of objects 1,2,3,4 and cache nodes A,B and C. To assign which cache node an object goes in, you move clockwise round the circle until you find an appropriate cache node. So in the below diagram, you can see object 1 and 4 belong to cache node A, object 2 belongs to cache node B and object 3 belongs in cache node C.
Consider what happens if cache node C is removed from the cache cluster: object 3 now belongs will be remapped to cache node A, and all the other object mappings are unchanged. Same way, If we add another cache node D in the position marked below in the diagram it will take objects 3 and 4, only object 1 belonging to A. The principle advantage of consistent hashing is that departure or arrival of a node only affects its immediate neighbors and other nodes remain unaffected .This approach reduces the remapping of the objects between the cache nodes and there by significantly decrease the swamping of backend servers in event of cache elasticity. Consistent Hashing implementation is available in most of the popular Amazon ElastiCache-Memcached clients we use every day. There is a saying “everything comes with a consequence”; since the approach used in consistent hashing is random, it is possible to have a very non-uniform data and load distribution of objects between cache nodes inside/across a cluster. To address this issue, more advanced KV systems like Membase and Amazon Dynamo uses a variant of consistent hashing. 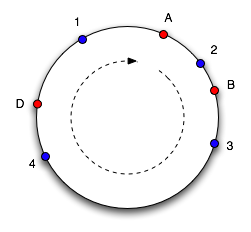 Instead of mapping a node to a single point in the circle, each node gets assigned to multiple points in the ring (Amazon Dynamo uses the concept of “virtual nodes”). A virtual node looks like a single node in the system, but each node can be responsible for more than one virtual node. Effectively, when a new node is added to the system, it is assigned multiple positions (henceforth, “tokens”) in the ring. To know more about this approach read Amazon Dynamo paper. I hope in future Amazon ElastiCache Team implements this concept in their distributed caching service as well, because it will help us optimally use nodes.